This is the fourth installment in a series of posts delving into the results of FIRE’s “Speaking Freely” report on college students’ attitudes toward expression on American campuses. In this post, we will talk about how the attitudes of community college students and 4-year undergraduate students differ in regard to expression on campus. After we published our “Speaking Freely” report, readers started asking us how attitudes toward expression on campus differed between students in community colleges and students in 4-year undergraduate programs. Although we collected this data initially, we didn’t delve into this difference in our report. We uploaded all of our tabs and toplines, and will make the entire respondent-level dataset public in the summer of 2018 for those readers who are interested in gaining a more in-depth understanding of public opinion on the subject. However, because students, faculty, and journalists have asked such similar questions about how 2- and 4-year students’ attitudes differ — we would like to provide some additional tabulations. As in the initial report, tabulations “have an estimated margin of error of [plus or minus] 3.1 percentage points at the 95 [percent] confidence level. Tabulations taken from subgroups of the sample have a greater margin of error. All of the reported tabulations are weighted.” The sample for our “Speaking Freely” report included 1,250 students at American colleges and universities. We did not oversample for community college students; 33 percent of our respondents reported enrollment in a community college. All of the new tabulations on 2- and 4-year students can be found here. Students at 2- and 4- year colleges report similar attitudes when asked if they are “comfortable sharing… ideas and opinions” in the classroom and on campus outside of the classroom. As we previously reported, 87 percent of students feel comfortable sharing ideas and opinions in their college classrooms. Similarly, 85 percent of 2-year students and 88 percent of 4-year students report feeling comfortable sharing ideas in the classroom. Outside of the classroom, 86 percent of students feel comfortable sharing their ideas and opinions on their college campuses. Eighty-five percent of 2-year and 87 percent of 4-year students report feeling comfortable sharing their ideas and opinions in this environment. There are slightly larger percentage-point differences between the attitudes of 2-year students and of 4-year students when students were asked about protest and intolerant and offensive ideas. As you can see in Figure 1, 66 percent of 2-year students and 55 percent of 4-year students strongly agree or agree that it is “important to be part of a campus community where [they are] not exposed to intolerant and offensive ideas”: an 11 percentage-point difference. 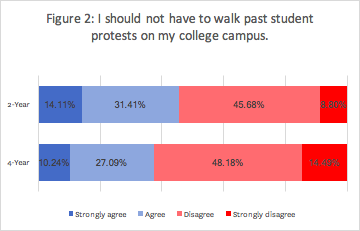 In Figure 2, you can see that 46 percent of 2-year students and 37 percent of 4-year students strongly agree or agree that “[they] should not have to walk past student protests on [their] college [campuses]”: an 8 percentage-point difference. These are the largest percentage-point differences in attitudes between 2- and 4-year students that we observe in our new tabulations. Two- and 4-year students report similar attitudes when asked about guest speakers and hate speech. As we previously reported, “a majority of students (92 percent) agree that having guest speakers on campus is an important part of the college experience.” Similarly, 91 percent of 2-year students and 92 percent of 4-year students strongly agree or agree that “having guest speakers on campus is [important].” And consistent with our previous finding that “although… most students (93 percent) agree that their school should invite a variety of speakers to campus, more than half of students (56 percent) agree that there are times when a college or university should withdraw a guest speaker’s invitation after the event has been announced,” 54 percent of 2-year students and 57 percent of 4-year students strongly agree or agree that there are times when a college or university should withdraw a guest speaker’s invitation. Two-year and 4-year students’ attitudes toward hate speech are also similar. Forty-nine percent of 2-year students and 44 percent of 4-year students recognize that most hate speech is protected by the First Amendment. For reference, 46 percent of college students recognize that hate speech is protected by the First Amendment. Thirty-seven percent of 2-year students and 34 percent of 4-year students think hate speech should be protected by the First Amendment, whereas 46 percent of 2-year students and 49 percent of 4-year students think the First Amendment should not protect hate speech. Our next post will introduce new data on American adults’ attitudes toward hate speech and compare these attitudes to those of college students, so be sure to check back to FIRE’s Newsdesk after Thanksgiving!